Brisbane’s column only reminds us how stubbornly most news organizations still cling to their opacity. The Times is relatively forward-thinking about corrections policies, but for it, as for most of our news institutions, public accountability remains more of an aspiration than a way of life. I agree with Jay Rosen that Brisbane’s suggestion, if implemented, would mark a “major step forward in transparency.” Still, my cheers for Brisbane’s column were muted a bit by its clumsy framing of the challenges the Times and its peers face as they set out to open themselves to public scrutiny. Brisbane seems to be under the impression that posting a set of policies presents the Times with difficult technical challenges. In reality, the technical and design issues here are nonexistent — posting a bunch of static web pages shouldn’t take the Times staff more than a few days, if not hours. The problems, rather, are organizational: Most institutions are reluctant to expose their inner workings to sunlight. Newsrooms are no different — but they should be. They exist to inform the public and hold powerful people and institutions accountable. They should set an example for those they cover, not just to avoid hypocrisy but also to earn back some of the public trust they’ve lost. The Times should step out ahead of its industry peers by creating a reader-friendly portal to its policies on ethics, style and usage, blogging, anonymous sources, social networking and other subjects that readers and journalists care about. I envision a link on the left side of the NYTimes.com home page that would take you to a Journalism Policies page where you could locate topics using a search tool. A link! A page! Topics that are searchable! There isn’t a content management system in use today that doesn’t make providing such material a snap. The Times probably employs several. Yet Brisbane goes on to assert that “building the portal would require considerable programming time.” Really, it should take zero programming time, a tiny bit of a designer’s time, and a modest amount of editorial time to prepare and organizes the policy pages. That’s it. The real cost to the organization would lie in the long meetings where editors would have to hash out whether they can really commit, in public, to every avowal of each existing policy. Once you publish detailed policies, as Brisbane points out, you face inevitable “headaches” as the online public begins to compare the paper’s stated policies with its daily practices. Well, get out the Tylenol. These are the very same headaches that good journalists visit every day on public officials, businesspeople, and everyone else they write about. Goose, meet gander. By all means, let the Times and its competitors follow Brisbane’s suggestion. But his “policy portal” is a bare minimum, a catch-up-to-the-present move. It’s a small down-payment on the kind of real transparency that we have every right to expect newsrooms to epitomize. News providers should go way beyond spelling out their policies for the public; they should unveil as much of their actual practices and processes as they reasonably can. One of the tenets of MediaBugs is that there’s value in providing a public, permanent space for discussion and debate about potential errors in news coverage — illuminating a process that has traditionally taken place in the dark. As Brisbane says, this sort of thing provides dividends in trust that journalists today desperately need. It also actively improves the coverage journalists can provide, which should be more than enough reason to do it. In his latest Sunday column, New York Times editor Bill Keller tries to lay out the Times’ ideals — as distinct from the work of “guerrilla” newsies like Julian Assange and James O’Keefe. Keller’s credo: Verification beats assertion! Correct errors quickly and forthrightly! Who’d argue? Anyone can embrace these principles; the devil’s in applying them. Of our major news institutions, the Times leads the pack today when it comes to correcting its goofs. It is, I think, the last of our media outlets to accept that the burden of “paper of record” authority means an endless parade of corrections. But the juxtaposition this weekend of Keller’s self-defense with a particularly glaring Times misstep leaves me with some unsettling questions. Writing on his Shanghai Scrap blog last week, China-based journalist Adam Minter took apart the Times’ Monday story about electronic censorship in China. The story led with a funny anecdote about cellphone calls in China getting cut off by government censors whenever they utter the word “protest” — even if they’re quoting Shakespeare’s “lady doth protest too much.” The rest of the piece wasn’t about cell-phone monitoring at all, but rather describes a recent tightening of Chinese Internet censorship. Minter thought the “protest” thing sounded fishy, so he performed an impromptu field-test. He was unable to duplicate the censors’ call cutoff, using three different phrases including “protest”, uttered in succession twice during cell calls to five different recipients in China. That’s just “anecdata,” sure. But so was the Times’ tale — and if it doesn’t pass this basic sniff test, it shouldn’t be in the paper. Whoa! This doesn’t sound good. The article did not point out that in both cases, the recipients of the calls were in the Beijing bureau of The New York Times. Because scrutiny of press communications could easily be higher than for those of the public at large, the calls could not be assumed to represent a broader trend; therefore, those examples should not have been given such prominence in the article. So the Times gets one cheer for dealing with this at all, and dealing with it quickly. But, given the evident breakdown in the editorial process, it also leaves us with a bunch of further questions. We still don’t know exactly what went awry here: How did a solid and important account of Internet censorship get saddled with a misconceived intro about cellphone surveillance — one that not only “should not have been given such prominence” but probably shouldn’t have been published at all? How did the Times’ editorial process override the evident objections of its reporter on the scene? One problem is that our newsroom culture still drapes errors in shame instead of handling them as inevitable byproducts of an imperfect business. Keller’s column talks about “taking yourself to the woodshed,” which is, if I recall, the place where you get spanked, or worse. The Times’ opaque Editor’s Note non-explanation is a symptom of a kind of defensiveness that infects most of our news institutions. Yes, we will correct our errors, say our editors. But first, they insist, prove to us we were wrong! Then, and only then, we’ll grudgingly admit it while doing our best to minimize it. But don’t expect us to tell you the whole story of the process that led to the error — unless it was so scandalous (see: Jayson Blair; Iraq WMD) that we feel we have no choice. This defensiveness is inevitable; it comes with our humanity. That’s why journalists committed to verification and accuracy need to bend over backwards to counter it. Keller makes this argument himself in his effort to explain why he considers the “impartiality” of Times reporters to be such an immovable principle. He writes, “Once you proclaim an opinion, you may feel an urge to defend it, and that creates a temptation to overlook inconvenient facts when you should be searching them out.” This is certainly true — and it is why the best opinion columnists make a point of seeking out the the most inconvenient facts and the strongest opposing arguments. What Keller doesn’t seem to see is that the logic he applies to opinion also holds for fact. Once a news organization proclaims a version of reality, its first instinct will always be to defend it. Trouble is, the defensiveness doesn’t protect the newsroom at all; it actually further undermines the public’s already shaky trust in the journalist’s work. The reader thinks: Why won’t they just tell us what happened? What are they trying to hide? So now Bill Keller is writing a regular column, and he’s given us his journalistic credo of verification, impartiality and the “business of witness.” Wouldn’t it be great for him to apply those ideals in his own writing about the Times itself? What if Keller used his column to give us forthright, open explanations of how the Times runs off the rails in cases like this Beijing phone-call affair? In other words, not just an editor’s note — an editor’s story. BONUS LINK: Felix Salmon takes Keller to the, uh, woodshed. UPDATE: I missed the simple factual error in Keller’s original column, (James O’Keefe didn’t impersonate a Muslim NPR would-be donor, his confederates did). But John McQuaid caught it and filed an error report at MediaBugs. The Times corrected it Sunday afternoon. The paper has let stand a broader misrepresentation Keller made about the O’Keefe affair (NPR exec Shiller, it turns out, offered a derisive description of the GOP via a quote from disaffected Republicans — he wasn’t expressing his own opinion). The technology press has been keen on the “blogging is dead” (or “dying”) meme for some time now, but it’s tough to find actual data or evidence supporting the notion. Blogging, of course, is changing; in the digital world, all is flux. But if you’re going to declare, as today’s New York Times headline does, that blogging is “waning,” it would be good to be able to show a decline in numbers. And that, sadly, is missing from the Times story — which cherry-picks statistics that look very different in their original contexts. Few of the activities covered in this report have decreased in popularity for any age group, with the notable exception of blogging. Only half as many online teens work on their own blog as did in 2006, and Millennial generation adults ages 18-33 have also seen a modest decline—a development that may be related to the quickly-growing popularity of social network sites. At the same time, however, blogging’s popularity increased among most older generations, and as a result the rate of blogging for all online adults rose slightly overall from 11% in late 2008 to 14% in 2010. Fourteen percent of online adults are making some effort to write regularly in public! That remains a phenomenal fact; if you’d predicted it a decade ago, as only a handful of visionaries did, you’d have been dismissed as a nut (or maybe a “cyber-utopian”). So the actual story — which, to be fair, the Times’ article mostly hews to (it’s the headline and lead that skew it more sensationally) — is that blogging keeps growing, but it’s losing popularity among teens. Social networking is changing blogging. (My postscript to the paperback edition of Say Everything addresses those changes at length.) More of us are using Facebook and Twitter for casual sharing and personal updates. That has helped clarify the place of blogging as the medium for personal writing of a more substantial nature. Keeping a blog is more work than posting to Facebook and Twitter. So I wouldn’t be surprised if, long-term, the percentage of the population blogging plateaus or even declines. Maybe we’ll end up with roughly ten percent of the online population (Pew’s consistent finding) keeping a blog. As the online population becomes closer to universal, that is an extraordinary thing: One in ten people writing in public. Our civilization has never seen anything like it. So you can keep your “waning” headlines, and I’ll keep my amazement and enthusiasm. At some point you’ll have more to say than fits in 140 characters, is too important to put in Facebook’s generic chrome, or you’ve matured to the point you want more flexibility and control around your words and ideas. And Anthony DeRosa points out that Twitter isn’t very popular among the teen set either. 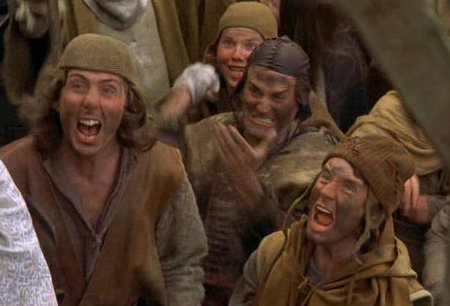 When you post to Facebook, are you a “serf”? When you write a blog post for a site that doesn’t pay you, are you a “galley slave”? These are terms that journalists at the New York Times and the Los Angeles Times have recently applied to the content users contribute to various Web sites and services. As we talk about the plight of journalists trying to earn a living in a rapidly evolving digital marketplace that has devalued each individual contribution and untied the product bundle that till recently paid the media bills, we need to distinguish between the plight of the journalist in a glutted market and the concerns of the citizen seeking a free voice. Maybe you’ll rethink that bargain now. If large numbers of people do, then Huffington and her investors may have just played AOL’s Tim Armstrong for a sucker. (Although, by Nate Silver’s calculations, most of the value and traffic on HuffPo derives from the content produced by paid staffers.) Maybe it would have been smart for Huffington to share some of her plunder with her unpaid contributors (as Dan Gillmor and others have urged); it would have been fair, certainly. But my hunch is the HuffPo bloggers aren’t going to stop writing for free. Most of them like the bargain. There is a reasonable argument to be made about “serfdom” online, but it doesn’t have anything to do with Huffington’s paycheck-less bloggers. It has even less to do with Google’s search engine, which draws its intelligence from the links we all embed in our Web pages. One problem with Carr’s column is that he conflates all these different services and — like so many content-obsessed journalists — ignores the contributions of the platform-builders and their technology. At Google, as at many of the companies Carr lists, there’s enormous value created by paid employees — but they’re writing code instead of copy. The aspect of the idea of digital “serfdom” that makes sense has little to do with getting a paycheck for your writing; it’s about control of the platform that delivers your writing and ownership of any (typically meager) fruits from that labor. It’s why many people, like me, choose to buy their own domain name and run their own blog software rather than use one of the free-but-corporate-owned alternatives. It doesn’t take much to have your own fief these days. In a perfect world, we wouldn’t have any of these platforms. In a perfect world everyone would have their own piece of the web that they own entirely. … Those tech savvy enough to rent out rackspace, install their own web server and plop down their virtual piece of land on the web control and capitalize on all of the content that they deliver there. However for most of the people on the web today, this isn’t the case. We live in a world of Digital Feudalism. The land many live on is owned by someone else, be it Facebook or Twitter or Tumblr, or some other service that offers up free land and the content provided by the renter of that land essentially becomes owned by the platform that owns the land. The argument about “digital labor” is real and valuable and has been unfolding for some time now in the academic wing of the new-media studies world. It’s what Dave Winer has recently been writing a lot about, as he urges us to find an alternative to Twitter and Facebook that we own ourselves. As they say in open-source land, there’s free as in “beer” and free as in “speech” — “gratis” versus “libre.” People aren’t going to stop writing “gratis” for Huffington and her ilk, and that will continue to lower the market price of all but the most specialized and rarefied kinds of old-fashioned journalism. Of course this doesn’t make me happy as a writer, but I’m not going to pretend it will stop. For that very reason, those of us who care about our words will need to pay greater attention to the “libre” side of the freedom ledger, and pitch our posts on ground that we own or control. Fretting about unpaid contributors is just another way of grieving journalism’s past. They’re here. They’re on social media. They’re talking. They’re writing. Get over it, journalists, and use the energy to figure out innovative ways to add the unique value of the journalist to the mix. The funny thing about online content, as former eHow owner Josh Hannah noted in contrasting Demand Media’s paid content-farm model with that of free sites like WikiHow, is that you often get better quality content when people write for nothing than you do when you pay them tiny sums of money, as Demand does. In other words, some people are more than willing to write for the recognition and reputation value and sheer passion (or other intangibles) rather than for money. And there will always be media entities like The Huffington Post that take advantage of that. 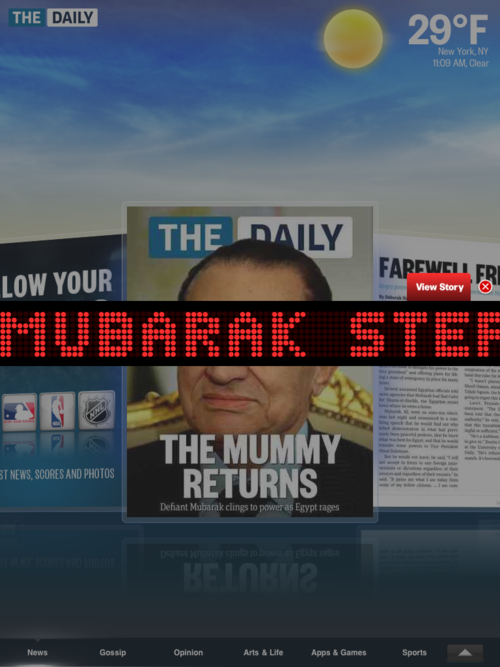 The Daily blog crowed about their three, count ’em, three different news covers yesterday tracking the fast-metamorphosing Egypt story. And they got some props for it from folks like PaidContent’s Stacy Kramer. Today, they’re proudly showing how they display a breaking-news ticker on their cover. They’re working fast over there at News Corp., cranking out the New York Post-style headlines (“Gypt,” get it?). And that’s just great. It means that the Daily’s staff is rapidly ascending the same learning curve that the creators of the first wave of Web news sites experienced 15 years ago as they realized that a daily news cycle for any Internet-based operation was hopelessly rigid and slow. Their only problem is that they’ve baked the cycle into their brand name. Whoops. What I’m wondering now is, what happens to all the cleverness of those cover headlines — and any other content that the Daily updates? How do you access the record of the past as recorded in the present by the Daily’s writers and editors? It’s not clear that the shareable, Web-based content pages have any permanence. On the 1.0 iPad app (I haven’t downloaded the update yet), there’s no apparent way to access past content that you haven’t chosen to save. Right now, the Daily seems to be simply throwing away its archive. You pay for it, you read it and then the next day you can’t get it back. What will Heather Havrilesky, or any other Daily writer, do when they want to review their clips a year from now? What will anyone do when they want to go back and see what Havrilesky said about their favorite TV show? This looks like just another way in which the Daily, even as it’s asking for your subscription dollars, seems to offer you less than standard, free news websites — which figured out a decade ago how to archive and preserve their back catalog. It’s not as if the Web has solved every problem: I’ve been arguing for a long time now that news sites ought to be preserving every version of a story as it gets updated over time. I think the Web will gradually move to this “track-changes” method of preserving history, but plainly it’s going to take time. Still, it’s a shame to see the tablet universe start again from scratch. Do we have to reset the learning clock at zero each time we move to a new platform? Beginning Monday, every new staff-written article on the Washington Post’s website came with a prominent link labeled “YOUR FEEDBACK: Corrections, suggestions?” One click takes the reader to a form for reporting errors or providing other feedback to the newsroom. This makes the Post the first major U.S. news outlet to heed the call that MediaBugs, Craig Silverman and I made with the Report an Error Alliance, urging news sites to make this sort of link a standard feature, like the now-ubiquitous “share” and “print” links. Actually, Post managing editor Raju Narisetti explained in an email that the new corrections link has been long planned as part of a broader content-management system upgrade. Conversations about corrections practices at NewsFoo, a digital news conference organized by O’Reilly in December (both Narisetti and I were there, along with Greg Linch, who recently joined the Post as a web producer), triggered more internal discussions at the Post. When the software upgrade’s January launch got delayed, the Post decided to move forward with a pilot of the report-an-error feature sooner, using a Google Docs form to collect readers’ input. As Josh Young pointed out, this sort of nimble, “grab whatever tool’s handy” web development is typical at startups but less common at large media companies. The Post is hardly the only major news outlet to hear this complaint. Our MediaBugs survey of correction practices across U.S. news sites chronicled a widespread pattern of obscurity and inaccessibility in this realm. But don’t news sites have comments? And can’t readers just post there about errors? In theory, yes. But in practice, on most news sites, the freewheeling debates and endless digressions of comment forums provide an inefficient channel for the public to get reporters’ and editors’ attention about mistakes and problems in stories. The urgent signal that “you got something wrong” gets buried in the noise. A dedicated channel for corrections reports and substantive complaints can be a labor-saving device for newsroom managers — a means to solicit priceless intelligence from the readers who, collectively, as Dan Gillmor famously says, know more than any individual journalist does. I asked Narisetti about reactions inside the Post and from the public. “The newsroom response so far has been good,” Narisetti replied, “in the sense it helps streamline what was an ad hoc process online even as we have very evolved policies on this in print.” After one day, he said, the paper had received “about six” submissions; two were about points of fact, and one has already led to a correction. That’s a goal worth setting and working on. What media executives call “engagement” is closely related to what other companies call “customer service.” Whatever you call it, journalists aren’t always comfortable with it, but newsrooms desperately need more of it, and the Post deserves hearty applause for pursuing it. Use an icon. The Post places its “YOUR FEEDBACK” link fairly prominently, in a right-column inset. But it’s all text, and the reader’s fast-scanning eye doesn’t always locate it on first pass. (Several people who read an early mention of the feature on Twitter mentioned that they couldn’t find it on the page.) Some sort of icon or image would really help. The Report an Error Alliance has proposed one icon as a standard (it’s right at the bottom of this post! ), and there’s an advantage to providing an image that users can recognize across many sites (like the RSS-feed icon). But we also know that most sites are picky about the look and feel of icons, and really, any icon is better than none. Make the form even easier to use. For instance, right now the form requires the user to input the web address (URL) of the story page by hand. In the final version of the feature, I hope the Post will automatically fill in the URL when the reader clicks on the feedback link from a story. Each step that you can streamline for the user is worth taking. Coordinate the new feedback loop with the old one. The Post site, like many newspaper sites, still displays a kind of split personality between the corrections policies and practices on the print side and those of the online newsroom. For instance, the “corrections” link at the bottom of every Post page points to a list of recent corrections and a block of instructions that appear to relate mostly to the print product. This gets confusing to readers, who don’t understand the organizational divisions behind such disconnections — and shouldn’t have to. Make the whole process public. The ultimate purpose for a newsroom to open an error-reporting channel is to restore public trust in the process of verification underlying the news report. To earn maximum trust, the channel ought to be transparent: It should be clear to the public whether the news organization is responding appropriately to reasonable feedback. Placing those responses out in the open, in turn, can help defend the newsroom when it becomes the target of unfair or irresponsible critics. Such transparency creates a kind of bedrock of trust, and it’s one of the motivating principles behind MediaBugs. Whether a news organization partners with a neutral organization like ours or prefers to handle the process by itself, conducting the exchange openly keeps everyone more honest. We know this all requires some new thinking, and maybe even a leap of faith, for many editors. It isn’t going to happen overnight. But we’re convinced it’s the future. 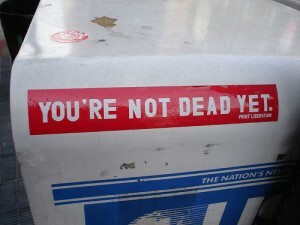 This post originally appeared on the PBS MediaShift IdeaLab blog. Murdoch’s Daily: post-Web innovation or CD-ROM flashback? A decade ago, if you were a “digital” person — if you were interested in how computer technology was changing our culture and economy — then you were a Web person. The Web, built on top of the Internet and ultimately eclipsing its source, dispatched its competitors — the closed online services, the packaged-goods multimedia/CD-ROM industry — and became, for a time, the single face of the digital revolution. 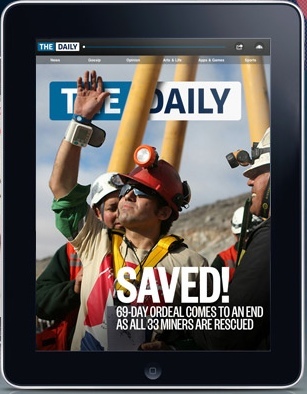 This week’s launch of Rupert Murdoch’s iPad “newspaper,” the Daily, is a milestone: It’s the first significant attempt, since the Web conquered the digital world in 1995, to create a major new media product that embraces technology yet spurns the Web — and the public Internet, too. Chris Anderson’s Wired “Web is Dead” package was the warning shot for this phenomenon, but the Daily’s introduction puts it in front of us in palpable touch-screen form. It boldly declares: We’re digital people but we’re not Web people. In other words, most of the apparatus of two-way communication that every serious digital publishing venture of the past 15 years has taken as a given is missing from the Daily. They’re serious about this iPad-only thing! But they don’t seem to realize that they’re repeating the mistakes of the very recent past. The Daily’s designers are eager to show off sparkling graphics, integrated video, and the swipe-ability that the iPad allows. Unfortunately, they are defining “interactivity” the way the lost pioneers of the 1994-era CD-ROM “multimedia revolution” defined it. They have built a gleaming but limited set of interfaces for users to interact with static, prepackaged content. The Web taught us that true interactivity was the interaction between people moderated by the network — along with the personalization you could build into the network based on those people’s behavior. The Daily’s one concession to today’s Web is the mechanisms it provides for its readers to share individual stories via the usual routes — Facebook, Twitter, email. The recipient of your share notice receives a link to a URL that’s a Web-page version of the Daily article. We don’t know how long these web addresses will be good for. But for the moment, at least, it’s pretty easy to assemble a set of links that points you to the Web-accessible versions of each article in the day’s Daily edition. That’s what Andy Baio has done. How long will Baio’s index last? Will it still be easy to assemble after the Daily’s first-two-weeks-free period ends? Will the News Corp. folks ask him to take it down? We’ll have to wait and see. The question is whether the Daily’s secession from the Web is a matter of convenience or ideology for its creators. Did they put their energy into spiffing things up for the iPad — the hard, fun, innovative part — figuring that they can circle back to beef up their Web offerings later? Or do they feel that it is their calling, their mission, to leave the Web behind? My prediction: If they’re pragmatists about the Web, they’ve got a chance — they can adapt and evolve their product so it’s a little more up to date, less hermetic and more inclusive of the public that lives online today. But if they’re ideologues — if they really believe that what is essentially a magazine “pasted on a screen” is the future of journalism — then they’re in deep trouble, and the Daily will only be Murdoch’s latest and most spectacular digital money-sink. The first thing I wanted to do was tell the editors about an error I found on their website, which right now reports their launch date as Jan. 17, 2011. (The Daily launched today, Feb. 2.) There’s a standard contact form on the website, so I used that, but really, I wanted to contact the editors through their app, which would sorta make sense. But there’s no way to do so that I could find — no masthead page, no contact us page, nowhere to report errors or find corrections or anything of the sort. There are comments on each page so I posted a comment on the “front page” reporting the error. It will be interesting to see whether the editors are reading the (voluminous and as far as one can tell unmoderated) comments. There are no links of any kind in the content. Reading it feels like a spin in the Wayback Machine. I guess News Corp. thinks that’s what people want? But surely, for $30 million, Murdoch could at least have gotten something a little more up-to-date — with, say, the mid-90s?